This feature is only found on the Basic Edition, or versions 3 and earlier of 3D. The Production Sheet replaces the Page Tab Editor on Interactive and Professional editions. 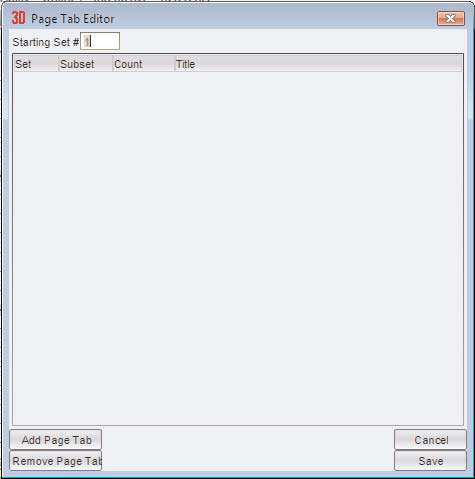 The Page Tab Editor is a utility that allows you to easily add, remove, and change any page tabs that appear on the Count Track. Starting Set # will change the starting set number. For example, if the first drill ends with page 23, the continuation file can begin with page tab 24. The Add Page Tab button adds a page tab at a count entered. Remove Page Tab removes the page tab that is currently selected in the list of page tabs. The Subset column is useful when moving only a certain section of the ensemble between two major pictures (sets). Say for example, everyone except the guard holds from page 2 to page 3. There’s no need to increase the total number of pages for just a guard maneuver between 2 and 3. In this case, you can establish the set as a sub-set. This will prevent the set numbers from incrementing the total number of sets, because sub-sets are labeled with letters. Adding a sub-set between our example of pages 2-3 would read, 2, 2A, 3. Click in the set Title column to enter a title for the page tab. When a title is entered, the title will be used in printouts. Page tab titles are useful to clarify reports. For example, imagine page tab #4 is a company front. Titling page tab #4 “Company Front” will print “Company Front” on any printout where page tab #4 is included. On the Basic edition, you would open the Page Tab Editor (found in the Utilities menu) and edit the starting set number. On Interactive and Professional editions, the starting set number can be edited in the Production Sheet. Click on the cell for the starting page number, and change the number to your new starting number. All subsequent pages will be automatically updated. What about version 9? I am unable to start the next movement with a continuing number.